(Newser) – Just one species of sea snake lives in the open ocean, even giving birth there—yet it can't drink seawater. 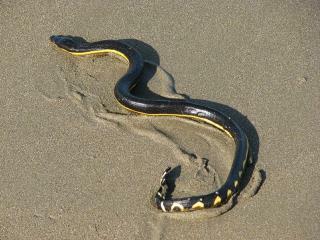 Scientists have been puzzled at just how the yellow-bellied sea snake survives, National Geographic explains. Now, they've learned that it simply doesn't have to drink for months at a time; in fact, as it gets dehydrated, it can lose some 18% of its body mass, Phys.org reports. To drink, the creature has to wait for fresh water in the form of rain, and that comes only during the rainy season; their natural habitat, off Costa Rica, goes through a dry spell between November and May. "When you scuba dive, you can sort of tell when it's raining," a researcher says. "I think the snakes can, too." "The researchers put the snakes in freshwater tanks and calculated how much they drank by killing them and baking them in ovens," Why couldn't they just weight them before the freshwater tank and after the freshwater tank. It would find the exact same thing without having to kill these beautiful creatures. The snakes' population numbers have been dropping, and it may be because of this dependence on those rainy months; climate change is altering rainfall patterns. OR, the fact that the morons studying them know no other way to do it than to catch them and bake them?